Remarkable is having a back to school sale on the Remarkable Paper Tablet. They have it marked down to $499. It regularly sells for $599 so $100 off is a pretty big discount. The Remarkable Paper Tablet is on sale from the Remarkable website and on Amazon. At Amazon there’s a $100 off coupon that you have to apply to get the discount. The Remarkable has a 10.3-inch E Ink screen like the Onyx Boox Note and Sony DPT-CP1. But the Remarkable is geared more toward writing and drawing than ereading. 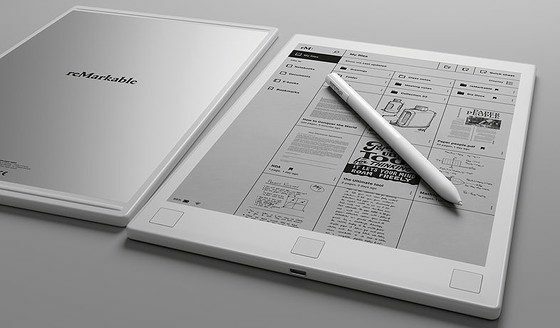 It has a Wacom touchscreen that is fast and responsive, with support for pressure sensitivity and tilt, and it has more writing features than other E Ink notepads. It does support ePub and PDF formats so it’s a serviceable ereader, and they recently updated the software to improve the reading experience by adding table of contents support and search, but the reading software still has a long way to go to compete with other ereaders. At $499 it’s cheaper than the Sony and Onyx Boox Note, but there’s also the new 10.3-inch LikeBook Note that just turned up for $419. It doesn’t have a Wacom touchscreen so the writing experience is unlikely to be anywhere on the same level, but it does add a frontlight to the mix. See my Remarkable review for more details about the device and to see a video of it in action. If my primary use for the ReMarkable or new Sony device would be PDFs and not digital note taking, would a Kindle DX be a better option? I’ve seen conflicting info about whether I can even register a DX to my Amazon account anymore. If you want to read Kindle books the 10.3″ Onyx Note is the best option because the Kindle app works pretty well. Even though the app is a little laggy it’s way better than the Kindle DX ever was. I am an early adopter of the Remarkable tablet. I wish I hadn’t done that, despite the great early price ($350). Why? Because they have no plans to provide any means of dropbox, google drive, or any other out-of-house support for sync’ing content. I know because I asked. They seem to think that they’re own app suffices. For me, it does not. Personally, I think they’re nuts for not offering it. But they clearly have a very different opinion. I’m reminded of what French car manufacturers said decades ago the first time they pulled out of the American market: they blamed American car buyers for their failure to appreciate French cars. This sounds like more of that.